I’m a big fan of Easter. In recent years the occasion has taken on more of a faith-based significance in my life, while the novelty side of the holiday has been emphasized since adding children to our family. I talked about this a bit here but we’re pro Easter bunny in the Bosse home and we love every second of it. Some of my earliest childhood memories involve excitedly searching for a basket of simple items carefully hidden in our home by the ‘bunny,’ also known as my mother. I love passing this tradition along to our boys now, and seeing their same excitement and joy. I bought Lachlan’s white wicker Easter basket at Target for his first Easter in 2016. The blue monogram liner seemed like the perfect piece to grow with him for years to come, and at less than $15.00 it felt like a bargain. Last year when I was pregnant with Everett but not yet sure if he was indeed a boy (well, we KNEW just not officially!) I was meandering Target only to find they had already put out their Easter stuff. I saw the basket liners on display, the same liners as the one we have for Lachlan, and panicked because I didn’t know what color to get. I know, I know what a luxurious problem to encounter! 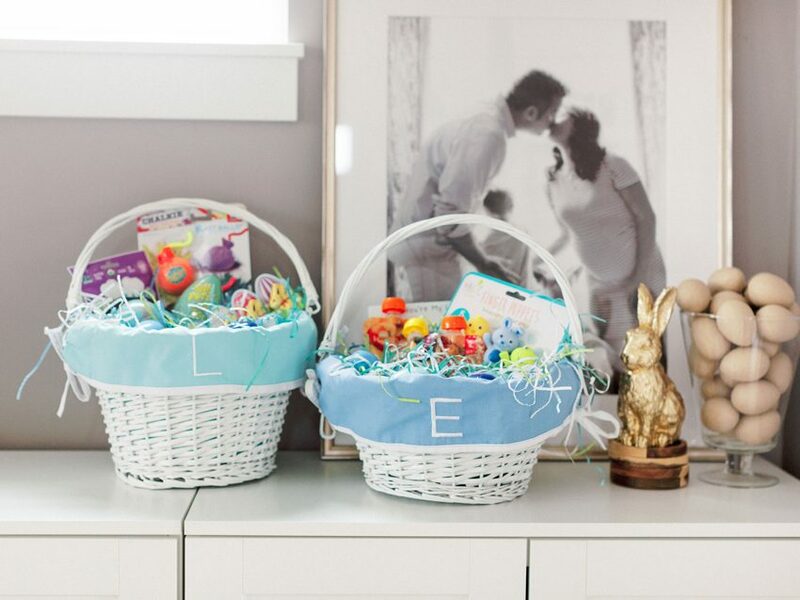 Joking aside, as one who deeply values the circumstances and tangibles surrounding all things celebratory, I wanted to have a similar basket for the baby, our next child, so it would coordinate with Lachlan’s. 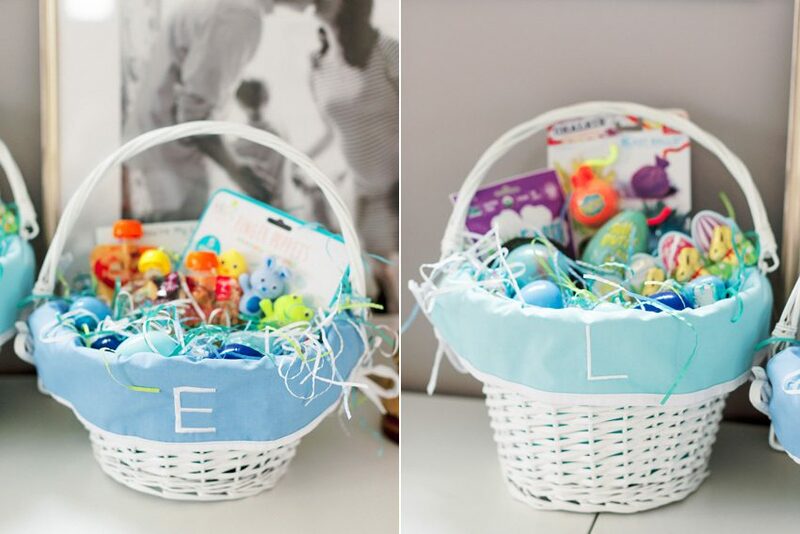 And so for years to come, those baskets together would bring joy when they sat side-by-side on Easter morning. I also knew that whether this babe was a girl or boy our kiddo’s name would start with the letter ‘E’ (more on that here), so I did a gut check, grabbed the blue liner, and just knew. I remember walking out of the seasonal section by the purple and pink liners and smiling because that whole intuition thing we have as women is so powerful. Good thing pregnant Rhi knew what mama-to-two-boys Rhi would want. Anyway, as you’ll see, while I scored the correct liner monogram, what I didn’t realize until just last month, is that the basket sizes and liner colors are actually quite different. Mom fail? While I love the contrast between the two sizes and liners, I’m hopeful it’s not something that one day the two boys with argue over; does anyone ever remember childhood arguments with siblings over silly things like that? Hand raised high over here. 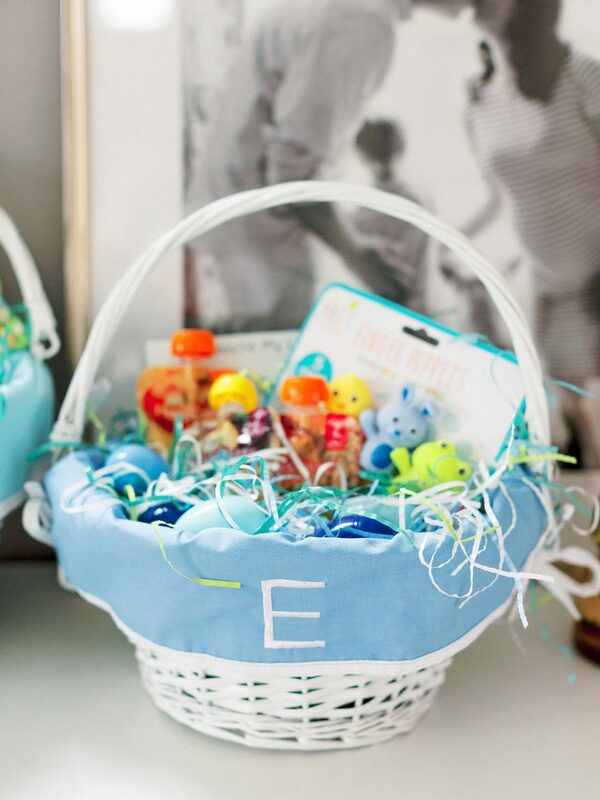 • A handful of plastic eggs in various shades of blue, each one containing a single piece of chocolate. As the boys get older, a bit more responsible, and it’s developmentally appropriate, I’d love to fill plastic eggs with coins. • Five mini milk chocolate Lindt Easter bunnies. I’ve been putting some form of these mini Easter animal chocolates in Lachlan’s basket since he was a baby and if anything, it’s more of a tradition now. Mark my words, my boys will get these adorable treats sent to their college dorms one Easter holiday very far from now. • A pack of organic gummy snacks from Yum Earth snagged in the ‘healthy’ Easter candy section. Rather than throw in more chocolate I opted for a healthier snack addition that will probably come on our next trip with us. There are many other snack options to consider here but these cute festive shapes were an added bonus! • A large green Crayola Silly Putty egg. I give it a week or two before this stuff becomes either covered in dog hair or boring to my constantly moving three year but either way it’s a fun addition that reminds me of when I was little. Remember squishing Silly Putty onto a piece of newspaper so the ink magically rubbed off onto the putty? • A glow in the dark bath bomb, which I did not personally make, but will surely make one of Lachlan’s evening baths pretty fun and exciting! Given my side hobby of soap and bath product creation, I often struggle with purchasing these types of things but this was too good to pass up for my bath-loving kiddo. • And finally, I have such a hard time being comfortable with buying or even receiving gifts for Lachlan (or Everett) in the form of new toys because we already have SO many. And most of the toys we have just get overlooked and create such disorder and clutter in our home. So I try to gift things that are temporary delights, edible, OR needed like new socks, sundries, or in this case, these fun sidewalk Chalk Blast Bombs. I found them at Hobby Lobby and knew they’d be perfect for those first few spring days when we can go outside and comfortably play. • Three baby food pouches because again, I like to combine pleasure with necessity when it comes to gifts for my children. Ev goes through quite a bit of food now that he’s eating solids and these will easily get devoured the first week back to school after the holiday. I had an older women mention to me the other day how helpful it would have been to have pouches of food decades ago instead of the cumbersome jars she used! We love pouches. • This Magic Years bath time Easter themed finger puppet set, which is also available at Target in the seasonal section. It’s probably the sweetest little set of finger puppets I ever did see! I know our little sensory sensitive guy will adore these, during bath time or elsewhere like our upcoming first plane trip as a family of four! • This adorable You’re My Little honey Bunny book. Most of the books we read to Ev are hand me downs from Lachlan and that’s totally great. But a lot of the books we have are damaged or missing pages (ahem, Lachlan) and I wanted to get a special holiday specific book for just Ev. I’m also hoping to get a religious-specific Easter book for the boys to share to help teach them one of the big reasons we celebrate. I’d love suggestions if you have them! 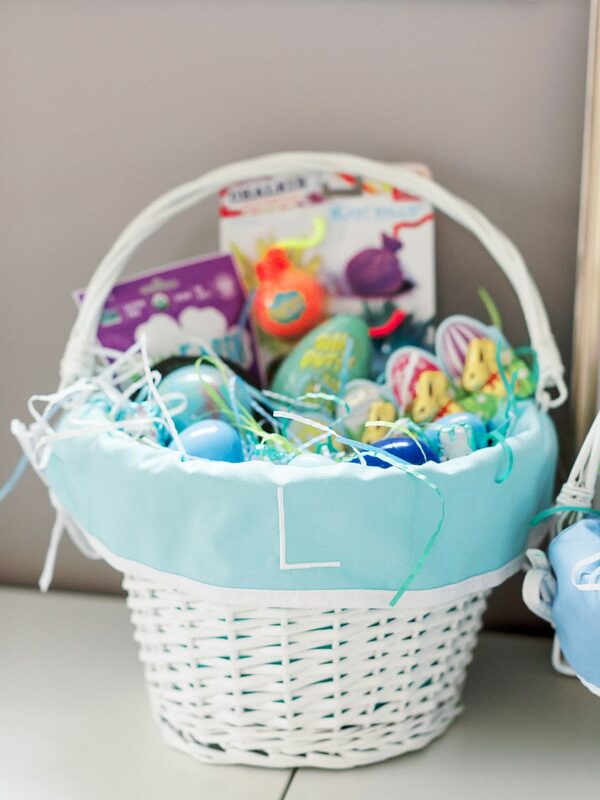 • Finally, the same blue eggs in Lachlan’s basket are in Ev’s, more so just to keep things equal. And while Ev can’t obviously eat the chocolate tucked inside the plastic eggs, I CAN, and this mama is going to totally be OK with this special little Easter surprise intentionally planned out just for her. Everything in moderation my friends. 1. Easter basket grass to me, is like lights on a Christmas tree. Without it things wouldn’t feel the same! But I also care about our planet so I reuse our basket filler year after year. I have also been using the same colored plastic eggs for our extended family’s short and sweet annual Easter egg hunt. Then the basket and grass I use for Andrew’s basket also gets saved. If it can be used again then I stash it in our Easter bin and tuck it away in storage. 2. Which leads me to this: yes, my adult man husband also receives an Easter basket. Since I am very confident he will not read this I can tell you in his basket is a new chef knife he’s wanted for a while, a $10 Starbucks gift card, new pair of socks, and dark chocolate Lindt bunny. He also has a few of the blue plastic eggs filled with chocolate. 3. Consider regifting items to your kiddos when appropriate. For example, when Lachlan was younger, I put one of his Jelly Cat bunnies in his basket as a festive filler. He didn’t need another stuffed animal or another thing IN the basket so the existing stuffed animal did the trick! Also, when it comes to birthdays and holidays, if the kids get too many things from friends and family, so much so that it becomes at all overwhelming to play with all at once, I’ll tuck some things away and bring them out at the next holiday or special occasion. I don’t at all feel guilty about this but instead consider it a responsible way to control our things versus being controlled by them. 4. 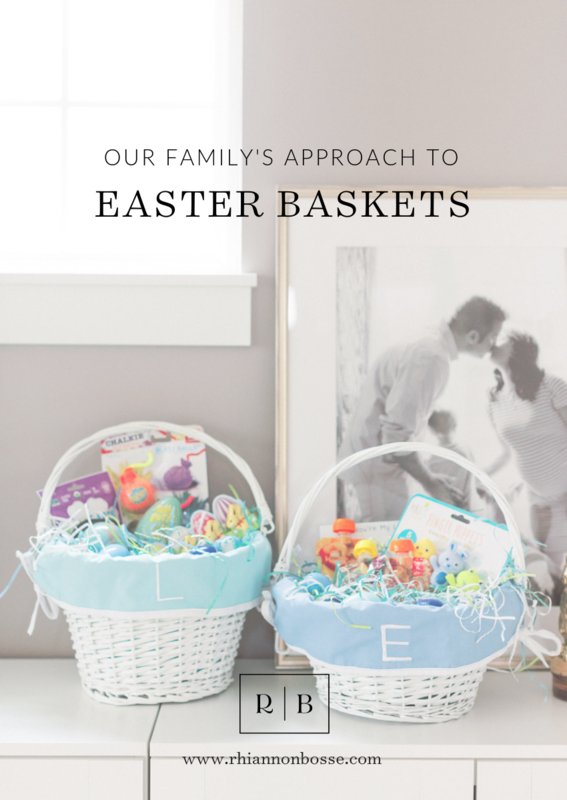 Finally, if shopping for things, creating Easter baskets, putting our seasonal decorations, and stuffing eggs and hunting for them, feels like a lot to adapt for your family, that’s totally cool! There are things we don’t do in our family because they feel like a lot (e.g. camping, oy) but making the holidays, both religious and otherwise, feel really exciting and magical because of the things, people, and traditions in them, is what we make space, money, and time for. Narrow in on what can be a priority for you and roll with it unapologetically! Camping, oy! I honestly cannot imagine you camping, but I think it would be HILARIOUS to see you try, so you’re welcome to come down to NC anytime and join the Rays and Thomases! 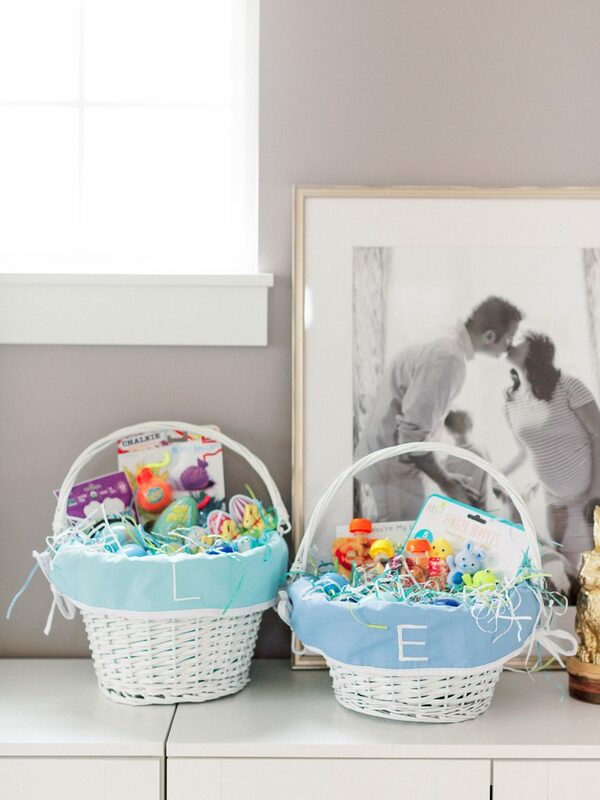 :) :) Love these sweet baskets!